Quick as a flash the first round at Oulton Park seemed to turn into the ‘Donington Decider’ at the end of the season. When we turned up for the first race, it felt like there was lots of the racing season to come and we could all take our time and enjoy the season. Every car on the grid started full of hope and ambition. Everybody thought they had a chance. That’s what makes the grid competitive and the drivers the people that they are. By the time the last round arrived, all the teams and all the drivers, in their heads, know their place. Even if their heart believes something else. The cars that are out of contention have all had bad luck, a bad BoP, a poor steward’s decision or been taken out by other less talented idiots. My regular readers will know that Joe, my Pro driver, and I have, of course, suffered all the above! In recent years, British GT has dubbed the last race the ‘Donington Decider’. Aptly named as, not surprisingly it’s at Donington Park and it’s the race that usually decides the destination of the GT3 and GT4 championships. This year was no exception. 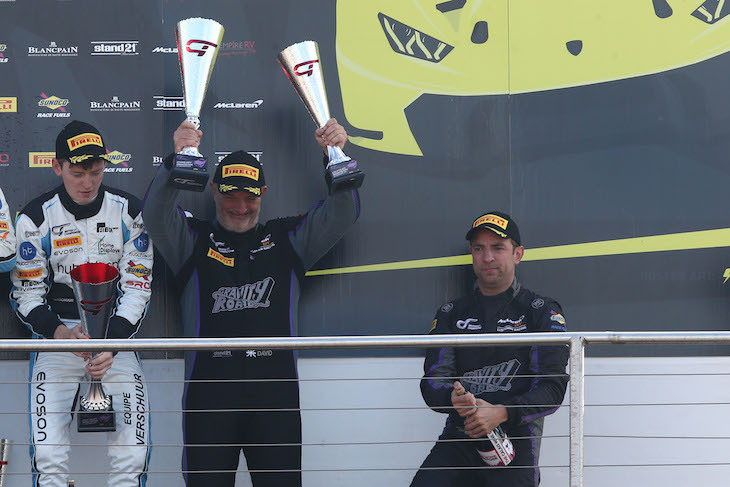 Going into the weekend, Flick Haigh and Jonny Adam had a good lead in the GT3 championship, but still had to get the job done by finishing the race. Which they duly did, after what looked like a pretty boisterous GT3 battle. Congrats to Flick for being both the best Am driver and the first woman to win the GT3 championship and congrats to Jonny on being the most decorated Pro driver in British GT history. Good job. In GT4 the BMWs looked to have sizable leads coming into the weekend, but after a see-saw race ended up in the top three covered by two points. Congrats to Jack Mitchell on his championship win, even though I’m pretty sure he was sweating towards the end. Our team-mates, the super-quick kids Michael and Charlie, ran them really close and did an amazing job in the race. At one point they were on to win the championship, but just missed out. It was tough to watch the disappointment on their faces. I seemed to come over all paternal! Their time will come, I’m sure. In GT4, Pro-Am Nick Jones and Scott Malvern duly wrapped up the championship and well done to them both. So, what about us? We arrived at Donington not really in contention for anything. You could argue that the pressure was therefore off, and we could just enjoy the race, show how good we were and get a great result. Which is in fact exactly what we did. Personally, I arrived a bit disappointed. It felt like it hadn’t been a great season and that ‘it should’ve been us’ competing for both the overall championship and the Pro-Am championship. I had never arrived at ‘The Decider’ without being involved in something to decide. The Donington Decider also proved to be the David Decider. I had come to the conclusion that my time as a British GT gentleman racer was to come to an end at Donington Park 2018. A big and painful decision – but the right one. I had come to racing very late in my life. My total racing career had spanned six seasons. Six seasons more than I’d ever thought I would do. Two seasons in the Ginetta GT5 Challenge and four seasons of British GT. There are always disappointments in racing, so it would be a lie to say that I’d enjoyed every minute. However, it has been a real privilege to drive the circuits, sit in a car, on those grids, against great drivers, and fulfil the dream of a five-year-old David to become a racing driver. Reaching the decision took time and I fought it and fought it. I wasn’t going to give in to the passing of time or let other people make the decision for me. Eventually, I got to the right place. I would like to say that there was no single reason to give up, instead a mix of different reasons that all added up to a ‘quitting while I was ahead’ position. My age was a factor. I’m the oldest on the grid by some margin. I’d be 63 next season and there’s no getting around the fact that it gets physically harder to race at this level. There’s also no doubt that the GT4 grid has got more and more competitive. No complaints from me – just an illustration of the popularity of British GT. It’s now seen as a good shop window for Pro drivers, allied to the fact that it has always been a great series, run really well by Benjamin, Lauren and the team, racing on fantastic tracks. Just to highlight the changes in GT4: in my first season, the grid was 95% Pro-Am, this year it was less than 50%. The Ams definitely have to work harder and harder to get anywhere near the front and the quality of the Pro driver has also increased. Joe, in most people’s eyes, is still the fastest and the best, but the gap to the rest is smaller than it has ever been. This despite him getting quicker. But there was just a single reason: in truth, deep deep down, I just knew. I knew that my time was up. If you read any of the biographies of the retired racing drivers, they all knew when the right time was. They just knew. The difficult bit is that once the decision has been made in your head, it becomes a very different feeling when you’re sitting in the car. What about the race weekend? The four weather apps had been working overtime in the run-up. There was going to be some rain and it looked like there was going to be lots of it on race day. We had tested at the circuit a couple of weeks before. It had been a busy general test day with a lot of slower cars in the morning, and it had rained so hard in the afternoon that it was too dangerous to go out on track. So, not ideal preparation. FP1 was really weird. I have always been a bit nervous before getting in the car, but always bullish and confident when driving it. This just felt a bit different. I was still nervous as I went out on the track. That had never happened before. Slow as a slow thing and a bit flustered. But after a good talking-to from myself, normal service was resumed and in FP2 and on a new-tyre run, I matched my qualifying time from 2017 on a slower track. Donington seems to suit my driving style and it’s always the track where I get closest to Joe’s lap times. This year was no exception, except in a rather wet qualifying. By Saturday lunchtime, the weather apps had started to behave themselves and it was looking like a dry race day. I neglected to look at the Saturday afternoon and after a long shower, it was to be a wet qualifying. Ugh. I had never driven around Donington in the wet, so my confidence was low on setting a good time. I had always needed time to get to a decent wet lap time and 10 minutes of qualifying was never going to be enough for me. In four laps, I found about 10 seconds and got to an okay time. Fortunately, Joe was fastest of everyone and we were to start fifth in class and 13th overall. My two ‘targets’ were miles in front of me on the grid. Adam has always been a master in the wet and was close to the front. 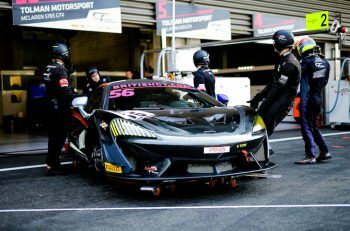 Graham, with Mike, had decided to give a GT3 McLaren a go, so was on a completely different grid. Back to the hotel and I was feeling okay. One of the added bonuses of the Donington race weekend is that we stay at the Radisson Blu. 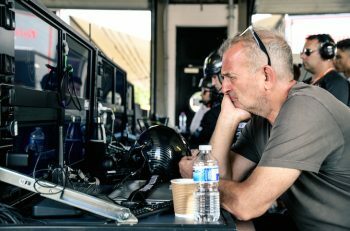 It’s my favourite hotel of the series, as most of the teams stay there and with its huge open-plan bar area, it’s good to catch up with the other drivers. It was a really relaxed, fun evening. Race day arrived, weather apps and weather in union. Dry and sunny. The team were all smiles and there was a chilled atmosphere in our garage. Did they know something?! We were joined by my son and two-year-old grandson, who’s absolutely obsessed with cars. He particularly likes it when I crash! It did make me wonder what sort of cars he might be driving in the future, if indeed he drives at all. It also made me think what racing might look like in 20 years’ time. The race was to be the normal two hours, with me doing the first hour before handing over to Joe. We have had good starts this season; we have a really good start procedure and it has worked every time. Always gaining lap-one places. Just before the start I told the team over the radio that this was to be my last race. They seemed unsurprised, probably well informed, but Emma our PR magician was clearly moved. Redgate, the first corner at Donington, usually provides entertainment for the crowd. Our start was not one of our best, it was okay, and we just about held station. But in this instance, it seemed to work for us. Amazingly all the cars got through the first turn, but we didn’t have to wait long for the mayhem to start as at turns two and three, the Craner Curves, there were three pirouetting cars: a McLaren, an Aston Martin and a Ginetta. Through some good fortune, I missed them all and missed them again when they rejoined the track. It seemed the racing gods had decided we were going to have a good race and being a bit slower away was part of the plan. Well, that was my well crafted driver’s excuse for the slow start. You will find it on page 25 of the driver excuse manual. “Box this lap.” Oh no, this is it. The End. Let’s just say it was emotional. Can I just have another couple of laps, please? Not to be. I came into the pits ninth overall and third in class, having started 13th and fifth respectively. Due to the pro teams ‘enjoying’ a longer pit stop, Joe went out seventh overall and third in class. Decision time. Go harder for a podium and a class win or save some brakes. I seem to remember saying “nobody remembers who came fourth and second in class”. It’s probable that only a few more remember a third overall and a class win. But in that band of brothers would be me in my last race. Go for it Joe! And he duly did. He had 12 seconds to make up over about 12 laps to reach and then overtake a very quick Toyota. He got it done with a lap to go. An overall podium and a class win. Thank you, Joe, and well done us. Cue general elation in the #56 garage and across the whole team. Michael and Charlie had finished second overall. So, a good team result and the winner was another McLaren – a great result for McLaren. On the podium, Joe kept banging the bottle of champagne on the floor. I stupidly assumed that this was so the spray would reach the team below. I was soon put straight, as I was awash with sticky fizz and had a bottle stuck down the back of my overalls. And no time to retaliate, as he ran for the stairs. And then I was exhausted and elated and relieved and a bit sad all in one go. I wouldn’t be doing this again. I had gone full circle: in my first-ever race I had finished third and been on the podium. It seemed like a good way to finish. As mentioned earlier, Michael and Charlie missed the overall championship by two points. Being their team-mate had been a real pleasure, as well as with Lewis and Jordan in the other car. All very quick and all nice guys. I’m sure we’ll hear good things about them in their racing futures. Overall, Tolman missed out on the team’s championship by one-and-a-half points. A great team season and a great team. For the guys who worked on our #56, it’s thanks to my number-one mechanic Martin and all the guys who worked with him. I feel like we gave them a lot to do this year. So that’s it. In the days that followed the race weekend, I experienced a mix of emotions. One day very comfortable with the decision and then the next much less so. Eventually, it felt like the right thing to have done and as mentioned before the overall emotion was relief. There are too many people to thank, but not all of them in this blog. Maybe a few thank yous and a few thoughts, though. If you ever get a chance to fulfil a dream, then don’t hesitate, it’s never too late. 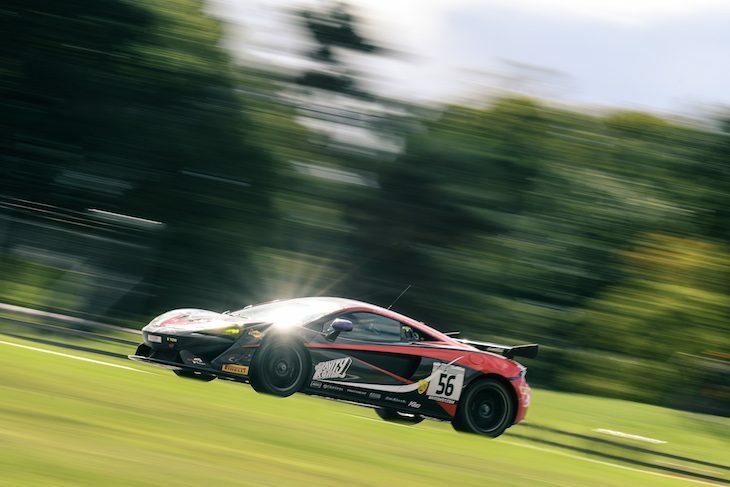 If you ever go racing in British GT, or something like it, then it’s worth doing it properly. Get yourself a great engineer – thank you Rob. Get yourself a great team-mate – thank you Joe and Luke. Get yourself the very best driver coach – thanks again Joe, you’ve been with me all the way. Get yourself into the best team with the most supportive team leader – I could not have done it without you Chris, thank you! A final thank you to everyone who reads these blogs and forgive me for this one being a little self-indulgent. I’ve really enjoyed writing them and hope to find a way of keeping writing something, somewhere, somehow.